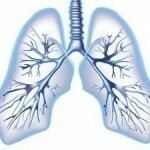 The lung is an essential organ in the body’s respiratory system. We have two lungs nested inside our ribcage. Each lung is conical in shape and they rest on top of the diaphragm (the area that separates our lungs from our digestive system). The left lung is a little smaller than the right because the heart tilts slightly toward it. Each lung is made up of muscular tissues, bronchus, blood vessels, lymphatic vessels and other nerve endings. The main function of the lungs is to take in oxygen from the atmosphere and release carbon dioxide from the bloodstream, back into the atmosphere. When there is an abnormal growth of cells in the tissues of the lungs, it results in lung cancer. As a consequence, this could lead to a condition referred to as metastasis which means the spreading of cancer, outside the lungs, to other parts of the body. When the lungs become cancerous it affects the normal breathing function that the lungs were designed to perform. Let us now look at some of the prominent causes that lead to lung cancer. 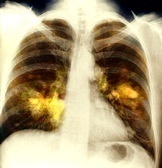 One of the common causes of lung cancer includes smoking. Cigarette smoking contains several chemicals that are carcinogenic. The development of lung cancer depends on a number of factors such as the age of the patient, the period for which the person has been smoking, how often he / she smokes and so on. If the person quits smoking, it will aid in the repairing of the damaged tissues in the lungs and the body might still be able to eliminate the toxic particles from the lungs. The survival rates of people who develop lung cancer after they quit smoking is higher than those who continue to smoke. The toxic substances found in tobacco and marijuana disrupts the normal passage of oxygen in the bloodstream. Oxygen is carried by the blood, via red blood cells, to the lungs. The lungs use the required percentage needed and converts the rest into carbon dioxide for us to breathe out into the atmosphere. This systematic exchange of gases gets disrupted due to the aftereffects of smoking. Therefore, with the lungs constantly taking in toxins by smoking persistently over a period of time, the tissues in the lungs begins to break down, and thus, there is not much respiratory membranes left for the exchange of oxygen and carbon dioxide. Another cause of lung cancer is passive smoking or secondhand smoke. Passive smoking is as dangerous as active smoking and occurs when a non-smoking individual lives or works with one that smokes. Another leading cause of lung cancer is coming into contact with asbestos for a prolonged period of time. Asbestos is a fibrous whitish-grey material that is very difficult to burn. These products were used in homes to provide insulation so as to prevent cold air, rodents and termites from infecting the walls and ceiling. However, the product that is used to compose asbestos, when inhaled over a period of time, leads to the production of cancerous cells in the lungs. An individual who smokes and also gets exposed to asbestos, faces a more pronounced risk of developing lung cancer. Asbestos is also responsible for another type of cancer called mesothelioma. This is the cancer of the pleura which is the outer lining that covers the lungs and the internal chest wall. It could also occur in the peritoneum (abdominal cavity’s lining) or the pericardium (the sac-like structure, surrounding the heart). Radium is a product of uranium. Radon is a by-product of radium. Exposure to radon is also a possible cause of lung cancer. Once again, the risks of developing lung cancer are increased significantly if the person exposed to radon also happens to be a smoker. Certain occupations may also lead to the exposure of arsenic, chromium, aromatic hydrocarbons or nickle. These can also lead to enhancing the risk of developing cancer. 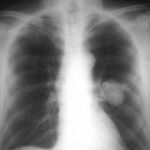 Patients who have already suffered due to certain lung diseases such as tuberculosis (TB) or chronic obstructive pulmonary disease (COPD) stand a greater risk of developing lung cancer. Similar to passive smoking, lung cancer can also be a consequence of being exposed to highly polluted air. Air pollution caused due to harmful toxins relased from vehicles, industries and power plants can also pave the way towards lung cancer. Patients who have already been afflicted with lung cancer are more susceptible to getting it a second time than first time lung cancer patients.